Glucosamine has been clinically proven to relieve joint discomfort, promote joint mobility and strength, and stimulate the growth of new cartilage. Arthritis pain: Fight Back Naturally Thousands of people have discovered new comfort with Relevamine GS. Recommended use is 3 times daily applied to the hands, wrists, elbows, knees, ankles or wherever needed. Anti-inflammatory. A versatile pain reliever TRAUMEEL OINTMENTAnti-inflammatory. Analgesic. 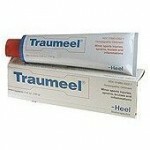 A versatile pain reliever, Traumeel provides temporary relief of minor aches and pains. Supports Relaxation and normal sleep. A dietary supplement to support muscle relaxation and normal sleep. * A synergistic combination of Valerian Root, Amino Acids, Herbs, and B Vitamins to aid in relaxation.